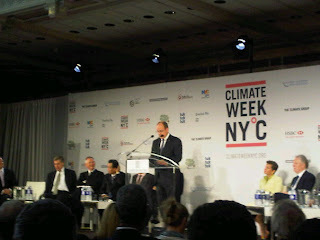 HSH Prince Albert II of Monaco is currently attending "The Value of Sport as a Tool for Development" conference in New York as part of the Millennium Development Goals Summit at the United Nations General Headquarters. This is being held to coincide with the General Debate of the 65th UN General Assembly this week and will include a review as to the progress of anti-poverty campaigns adopted in 2000 and, if these goals are not being met, to discuss ways to speed up implementation. Prince Albert also recieved an award from the United Nations for his efforts to promote peace through sport due to his many years of involvement with the Olympic Games (both as an IOC member and an Olympian) as well as his patronage of other sports for charitable purposes. The Sovereign Prince is High Patron of “Peace and Sport, l’Organisation pour la Paix par le Sport" and at the reception of his award was commended for his, “global leadership and passionate commitment as a champion of the cause of peace through sport”. More details on the award and the Prince's comments can be found here. He has also participated in Climate Week NYºC 2010 (seen above) in which he stressed again the need for widespread adoption of electric cars and discussed the dangers of rising sea levels due to melting at the polar ice cap; something he has done considerable 'first-hand' research in. More information on that gathering and their goals for electric vehicles can be found here.